Five Guys is the new diner-like restaurant in the Bullring. It opened about six weeks ago, replacing the former Italian restaurant, Del Villagio, with a fresh take on authentic, American fast food favourites. Don't mistake this for a fast food joint - not that you would if you walked past. Five Guys is a better version of Ed's Diner, which is Bimringham's only other diner-style restaurant in the centre. 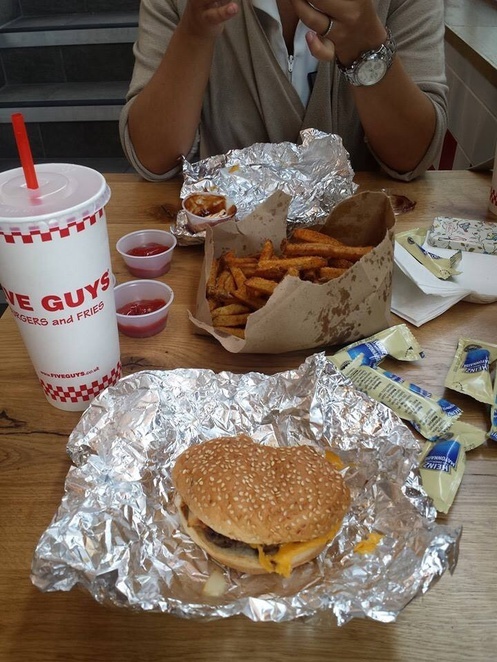 Firstly, the food is better; the burgers at Five Guys are well-filled, the meat is thickly cut, as is the bun, but there is, thankfully, a decent ratio of meat to salad and bread, constituting a happy bite. The restaurant has authentic qualities about it too, The fries are served in cardboard boxes and the burgers are wrapped in foil. I'd rather not pretend I eat burgers and fries with a knife and fork, and Five Guys does away with the notion of such airs and graces, and serves it, how I believe a classic American duo like this, should be served. In terms of atmosphere, it's a quite relaxed venue, with a mix of adults and nearly-adult teens frequenting the venue. It isn't cheap though, so it's not a place for teen boppers (thank God), but the hungry shopper who wants comforting, fast, tasty food. Pop in and you'll be seated immediately. You can enjoy a simple burger for £6.00 and up, or a meal (fries and a drink), for £10. Either way it's a happy medium of filling, satisfying, tasty food - you can't go wrong with that.